I have always loved good food. Growing up in an Italian family, where food was always the main event, my mother’s motto was “Better too much than not enough.” Years later, entrenched in my career, I picked up cooking as a hobby. I soon met and married Dave, who became my cooking partner as I embarked on years of cooking classes, dinner parties, canning my own vegetables, and making homemade pastas, breads and preserves. While raising our two children, I kept cooking between diaper changes and play dates, with my sights set on some culinary profession, someday, somewhere. Several years after moving to River Creek, I started a small catering business, which thrilled me. Things changed about two years ago when my Ulcerative Colitis (UC) brought me to a halt. UC is a gastrointestinal autoimmune disease similar to Crohn’s, which can severely impact one’s daily life, energy and freedom, and often results in surgery and other serious long-term issues. After 30 years with UC, my symptoms were worse than ever, and even steroids no longer helped. I was now facing monthly immune-suppressant injections for the rest of my life. Taking medications to suppress one’s immune system is like clipping the wire to the “Brakes” light on the dashboard – it masks the signal without addressing the problem. This seemed scary and illogical to me. Questioning conventional wisdom, I switched to an Integrative physician, crossed my fingers, and pursued a dietary approach. Amazingly, within just one month, all of my UC symptoms disappeared! I could not believe what had just happened. I had endured 30 on-and-off years of feeling ill, sleepless nights, sapped energy, lost time, E.R. visits, and countless rounds of prednisone with all its long-term side effects. I could not wrap my head around the fact that after 30 years of being told “diet doesn’t really matter”, the opposite was actually true: Diet matters immensely. By avoiding a handful of inflammatory foods and taking some simple supplements, I had accomplished the job at which prescription drugs had failed. I was feeling better, I was empowered, and I was ready to tackle my next challenge. Like so many others in Loudoun County, I had Lyme disease. Hello to months of heavy antibiotics! I quickly learned the hard way what antibiotics do to one’s gut flora (the magnificent ecosystem of microorganisms harmoniously living in our G.I. tract and responsible for 60-85% of our immune system.) Antibiotics wipe out the good bacteria first, which disrupts the balance of this ecosystem and can disable the primary arm of our immune system. Naturally, my UC symptoms began to resurface, so I stopped the antibiotics and turned to food once again. This time, I was determined to get to the real root of the problem. 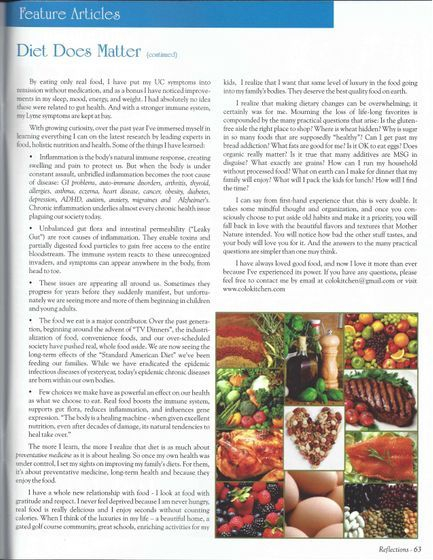 With some research and discussions with respected mentors, I discovered The Specific Carbohydrate Diet (SCD), a time-tested gut-healing protocol that not only eliminates inflammatory foods, but also rebalances the gut flora and heals the intestinal walls, thus resolving Leaky Gut and rebuilding the immune system. SCD is similar to The Paleo Diet and The GAPs Diet. These grain-free, sugar-free lifestyles are based on “Real Food”: Nutrient-dense, whole food that is fresh, clean, and really grows. For SCD, this includes high-quality meats, fish, eggs, yogurt, broths, cheeses, vegetables, fruits, berries, nuts, seeds and legumes, deliciously enhanced with herbs, spices, honey, and homemade marinades, sauces and gravies. I do not eat any processed foods or other “instigators” (gluten, wheat, corn or other grains, sugar, lactose, soy, GMOs, additives, preservatives, artificial colors/flavors, gums, stabilizers, or bad fats). Eating good healthy food need not be boring and tasteless. Some favorite entrees my family and I now enjoy are: Blackened Mahi Mahi seasoned with a paprika spice rub; Peruvian Chicken made with a lime-cumin marinade and drizzled with a spicy aioli; or Beef Braised in Red Wine, slow cooked until it melts in your mouth. As a side, I might serve Puree of Carrot Soup; Roasted Asparagus with Lemon, Shallots and Herbs; or Spinach Salad with Creamy Avocado-Honey-Lime Dressing. Desserts (using natural honey as a sweetener) range from addictive little Butter Cookies to tender Cupcakes with Buttercream Frosting to Lemon Bars to Frozen Yogurt. The possibilities are endless—how can I not love this food? By eating only real food, I have put my UC symptoms into remission without medication, and as a bonus I have noticed improvements in my sleep, mood, energy, and weight. I had absolutely no idea these were related to gut health. And with a stronger immune system, my Lyme symptoms are kept at bay. Inflammation is the body’s natural immune response, creating swelling and pain to protect us. But when the body is under constant assault, unbridled inflammation becomes the root cause of disease: GI problems, auto-immune disorders, arthritis, thyroid, allergies, asthma, eczema, heart disease, cancer, obesity, diabetes, depression, ADHD, autism, anxiety, migraines, Alzheimer’s… Chronic inflammation underlies almost every chronic health issue plaguing our society today. Unbalanced gut flora and intestinal permeability (“Leaky Gut”) are root causes of inflammation. They enable toxins and partially digested food particles to gain free access to the entire bloodstream. The immune system reacts to these unrecognized invaders, and symptoms can appear anywhere in the body, from head to toe. These issues are appearing all around us. Sometimes they progress for years before they suddenly manifest, but unfortunately we are seeing more and more of them beginning in children and young adults. The food we eat is a major contributor. Over the past generation, beginning around the advent of “TV Dinners”, the industrialization of food, convenience foods, and our over-scheduled society have pushed real, whole food aside. We are now seeing the long-term effects of the “Standard American Diet” we’ve been feeding our families. While we have eradicated the epidemic infectious diseases of yesteryear, today’s epidemic chronic diseases are born within our own bodies. The more I learn, the more I realize that diet is as much about preventative medicine as it is about healing. So once my own health was under control, I set my sights on improving my family’s diets. For them, it’s about preventative medicine, long-term health, and because they enjoy the food. I have a whole new relationship with food - I look at food with gratitude and respect. I never feel deprived because I am never hungry, real food is really delicious and I enjoy seconds without counting calories. When I think of the luxuries in my life – a beautiful home, a gated golf course community, great schools, enriching activities for my kids - I realize that I want that same level of luxury in the food going into my family’s bodies. They deserve the best quality food on earth. I realize that making dietary changes can be overwhelming; it certainly was for me. Mourning the loss of life-long favorites is compounded by the many practical questions that arise: Is the gluten-free aisle the right place to shop? Where is wheat hidden? Why is sugar in so many foods that are supposedly “healthy”? Can I get past my bread addiction? What fats are good for me? Is it OK to eat eggs? Does organic really matter? Is it true that many additives are MSG in disguise? What exactly are grains? How can I run my household without processed food? What on earth can I make for dinner that my family will enjoy? What will I pack the kids for lunch? How will I find the time? I can say from first-hand experience that this is very doable. 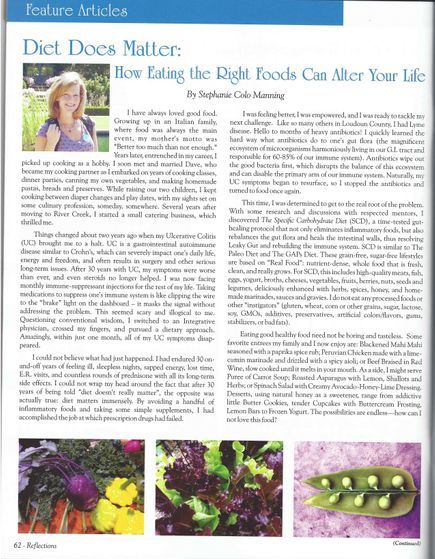 It takes some mindful thought and organization, and once you consciously choose to put aside old habits and make it a priority, you will fall back in love with the beautiful flavors and textures that Mother Nature intended, you will notice how bad the other stuff tastes, and your body will love you for it. And the answers to the many practical questions are simpler than one may think. I have always loved good food and now I love it more than ever because I have experienced it power. If you have any questions or for more information, please feel free to email me at colokitchen@gmail.com or visit my website at www.colokitchen.com.